Diane Jarvis, Sheffied BID manager with Charlotte Noble, retail supervisor at Museums Sheffield. Sheffielders will be able to treat family and friends to the ultimate local gift this Christmas – the Sheffield City Centre Gift Card. More than 60 shops, salons, theatres, cinemas, bars and restaurants have signed up to the card, which can be purchased online at www.sheffieldgiftcard.co.uk and loaded with between £5 and £200. The gift card is the first of its kind for a major city in England, and will be able to buy all year round. So that’s Christmas, birthdays, leaving gifts and congratulations presents sorted for a while! With so many businesses signed up - the full list of participating venues is available at www.sheffieldgiftcard.co.uk - there really is somewhere for everyone to spend their Sheffield Gift Card. From indie shopping favourites including Atkinson’s, Mooch Vintage and Syd and Mallory through to big high street brands such as Schuh, M&S, Debenhams, John Lewis. You can also use the Sheffield Gift Card at plenty of entertainment venues in the city. Film fans can redeem their cards at both Showroom and The Light cinemas, and both the Crucible and Lyceum theatres will be accepting the gift card. The city’s culture vultures will be able to spend their cards in Sheffield’s Graves and Millennium galleries. Bars and restaurants have also signed up, from Leopold Square’s Cubana to Devonshire Street favourites Forum, Common Room and The Devonshire. Sheffield’s new coffee wonderland, Mangobean, will be accepting the Sheffield Gift Card, as well as Ink and Water at the West One Plaza. For those who like to pamper themselves, some of the Steel City’s most well-known salons are also taking part in the scheme, including Wigs and Warpaint and Vanilla Hairdressing on Norfolk Row. 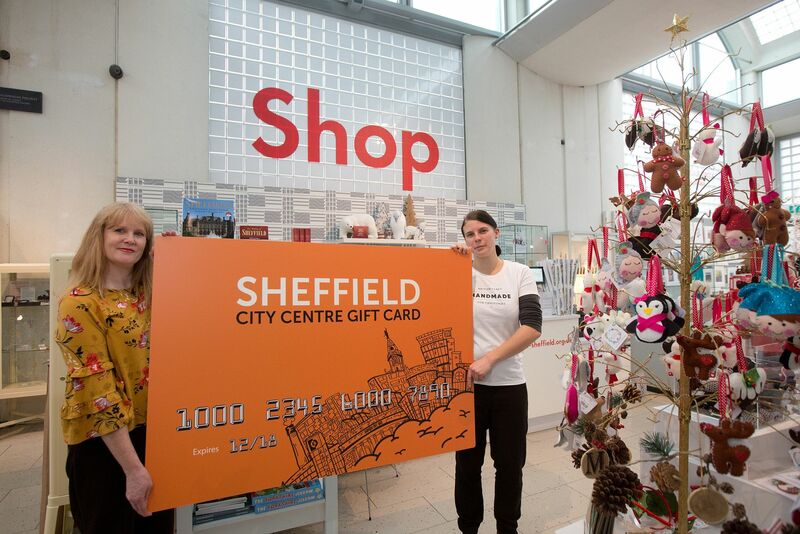 The Sheffield Gift Card has been designed by artist Matt Cockayne, and features a caricature of Sheffield’s cityscape. Sheffield BID, the organisation which has launched the scheme, hopes the card will encourage Sheffielders to shop in the city centre, rather than online or at Meadowhall. Buy your Sheffield Gift Card today and get it in time for Christmas. In Sheffield, Thursdays are traditionally for late night shopping, especially in the run up to Christmas, see the list of businesses opening their doors later during December or check out who’s alive after 5 in 2017.